is a wealth for those seeking hope. Since the fall of Adam and Eve, it’s been part of the human condition to go through pain, betrayal and disappointment. What makes each person’s journey different is how they respond to these challenges. Some believe in the ‘just get over it’ mentality where you bury your pain deep inside, hoping that by ignoring it, it will all go away. Others medicate their pain through chemical, physical and mental addictions. Half autobiography/half devotional study, Screaming on the Inside is a collection of stories from Albrecht’s life. Stories of sexual abuse by people she should have been able to trust. Stories of subjecting her body to bulimia in a desperate search for a false ideal of beauty. Of seeking freedom in a lifestyle that left her sad and empty. Of finally finding true love in a godly man. Of enduring the heartache of infertility and miscarriages. And these are only a few of her stories. As you read through this book, it’s hard to believe that all of this happened to one person. What is even harder to believe is that she was willing to be brutally transparent in sharing these stories and sharing the lessons she learned through them. That no matter what, God still loves us; that he will never abandon us and that he is there for comfort, healing, guidance and provision. At the end of each chapter, Albrecht offers a life application study guide –complete with numerous Scripture references and prayers. 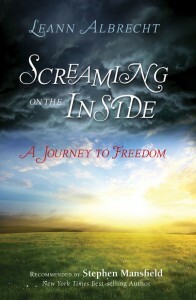 Although simply written, Screaming on the Inside: A Journey to Freedom is not a simple book. It is a wealth of encouragement for those who are looking for hope in the midst of tragedy. Awesome review Leann, and true! Everyone could be transformed by the lessons/healing you’ve received and shared!